Hello all! After taking a vote on twitter and facebook, it was decided that today for Try New Adventure Thursdays I'd bake Coffee Chocolate Cupcakes topped with Baileys Irish Cream Frosting. So, I've done just that...and be warned, by the time you finish reading this blog post, your mouth is sure to be watering! I found the recipe on Ming Makes Cupcakes. The same place I got the recipe for the Sour Cream Raspberry Cupcakes I made a couple months ago and loved. Her recipes are fabulous because they're simple (you probably already have most of the ingredients in your kitchen) and unique, since when did did you come across recipes for fig, apricot or parsnip cupcakes? First, in a small bowl, dissolve the baking soda in room-temp. buttermilk. 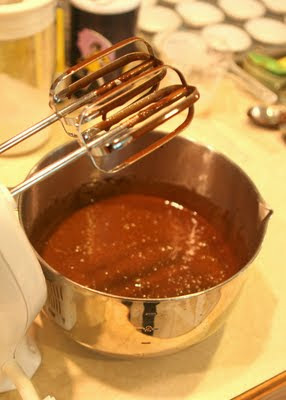 In a small sauce pan melt together on low the butter and cocoa. When melted and smooth, add coffee. In a separate bowl, sift together sugar, flour and salt. Add the cocoa mixture and egg and mix on low. 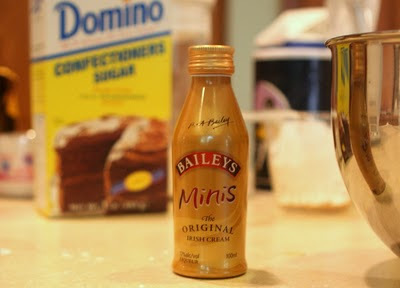 Add the buttermilk mixture and vanilla extract to the rest of the ingredients and beat until smooth. 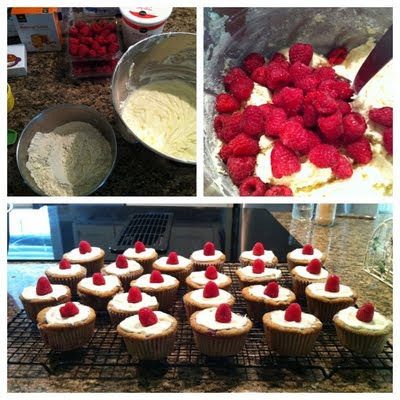 Poor your finished recipe into cupcake pan and bake at 350 for 20-30 mins or until a toothpick comes out clean. Now it's time for the yummy frosting! Beat all of the ingredients listed above together until smooth. That's it! Just spread it on the cupcakes. YUUMMM! If you make these tell me what you think. If there's one critique I have, it's that the cupcakes aren't as coffee-flavored as I'd hoped they'd be. Next time I'll try using much stronger coffee. P.S. Although I was never able to get my visa, my passport is being mailed back to me. I'll be going over with Kurt as a "tourist" for the time being. Hopefully we'll get visa stuff straightened out later. WE BOOKED OUR TICKETS FOR MONDAY! London here we come =). Yum! Those look awesome! And the UK is bein lame :/ have y'all found a place to stay yet? Candace, yes they are...we've really had a hard time. Not exactly the way I wanted to be introduced to the Brits, haha. We don't have a place yet, our goal is to find one within the first couple days of arriving. We've been talking with an agent over there who's got a list of places for us to view.